StringFest features four of the region most adventurous string bands on Thursday, March 21 at DROM, New York City. DROM is at 85 Ave. A., in New York, NY, 10009. 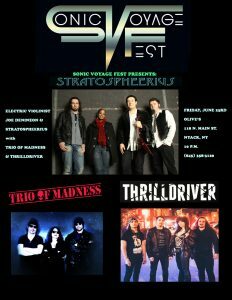 The bands performing are: SEVEN)SUNS at 8 PM, MazzMuse at 9 PM, Joe Deninzon & Stratospheerius at 10 PM, and a surprise at 11 PM. The Ticket buy link is https://www.ticketfly.com/event/1820046/. We’re excited to bring the Sonic Voyage Fest to two of our favorite New York State venues. 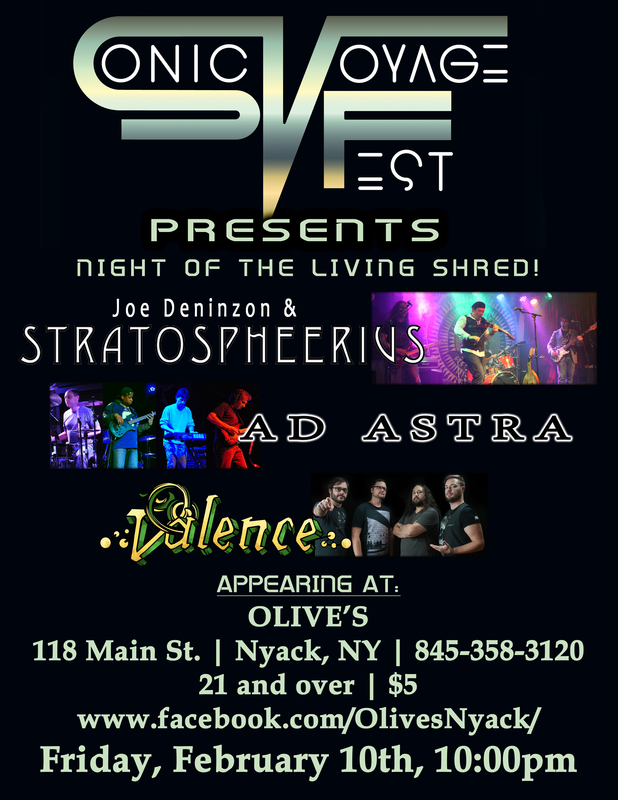 December 15: Olives, Nyack, NY w/ Joe Deninzon & Stratospheerius. October 19: Look for a show in Elkhart, IN and October 20 in Madison, WI. King Llama, Joe Deninzon & Stratospheerius, Aisles will be rocking’ the Elkhart, and King Llama, Joe & Stratospheerius, plus White Bush Unicorn in Madison. King Llama and friends are working on some October shows, and Joe on some December New York and the first Canadian show. 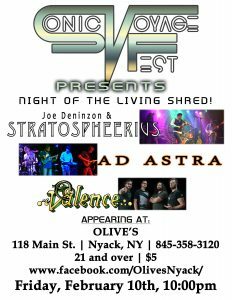 Joe Deninzon & Stratospheerius, and friends: Trio of Madness, and Thrilldriver will be rock ing Olive’s, 118a Main Street, in Nyack, Admission is $5, venue phone is 845-358-3120, http://oliveboss1.wixsite.com/olives. 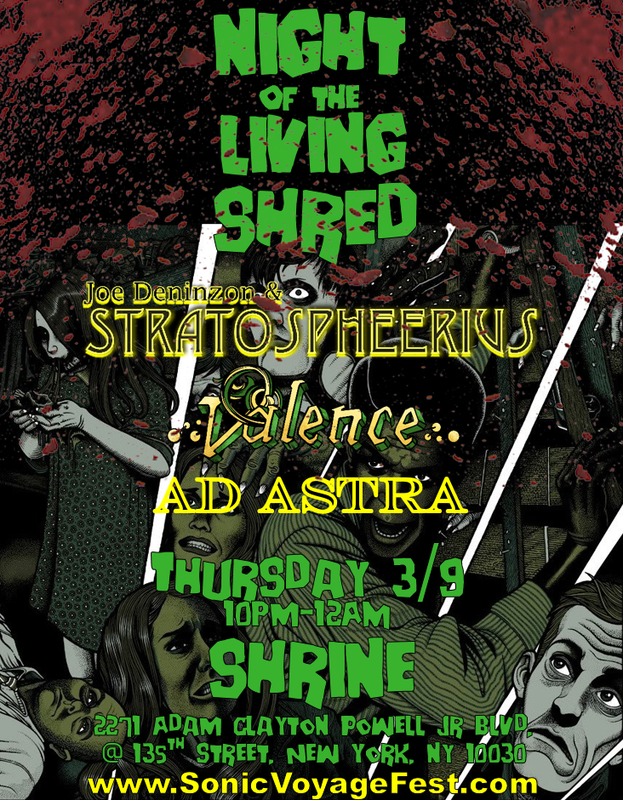 Joe Deninzon & Stratospheerius and Ad Astra and Valence will be rocking Sonic Voyage Fest’s Night of the Living Shred this winter. Friday, February 10: Olives, 118 Main St., Nyack, NY, 7:30 pm, 21 and over, 845-358-3120. Thursday, March 9. 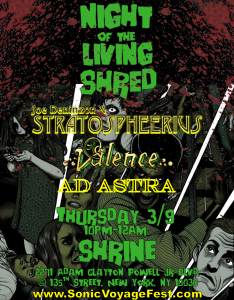 9 pm: The Shrine, 2271 Adam Clayton Powell Blvd. (at 135th St.), Manhattan, NY, 212-690-7807. 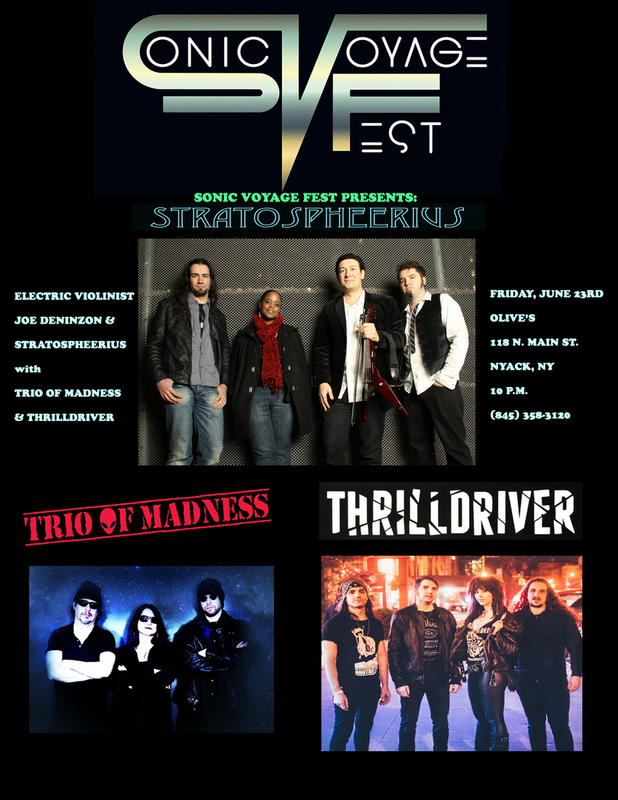 First up: Nyack, NY on Feb. 10: Here are downloadable flyers to share. 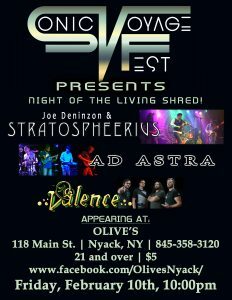 Friday, February 10: Olives, 118 Main St., Nyack, NY, 10:00 pm, 21 and over, 845-358-3120.